Microsoft has transitioned from Azure Mobile Services to Azure Mobile Apps. 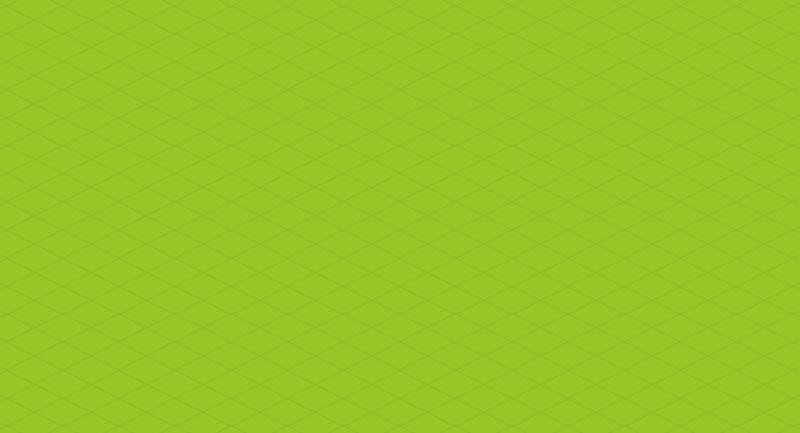 While Azure Mobile Apps offer a wide range of new features, they miss a really useful one. 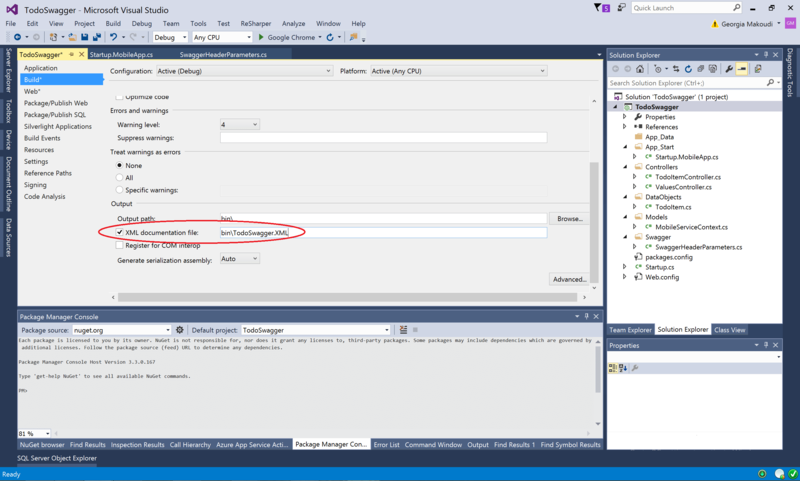 Azure Mobile Services offered a demo client to test your APIs and unfortunately, Azure Mobile Apps don’t offer this feature out of the box. 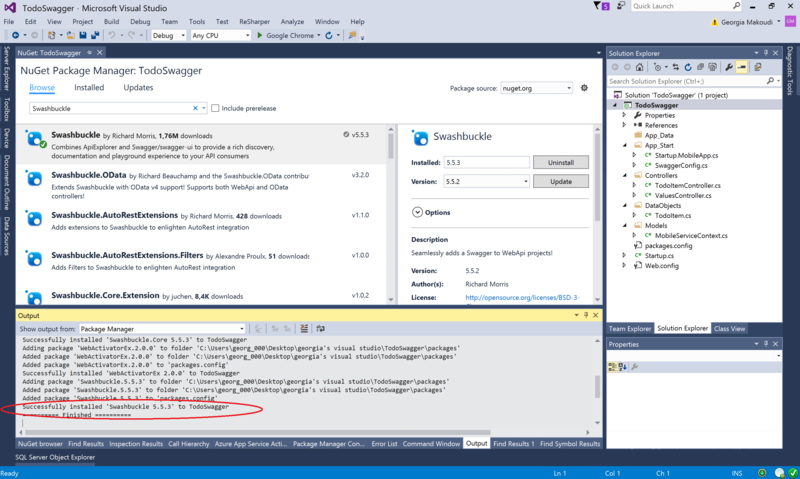 To replace this feature, you can add Swagger to your Azure Mobile App and here are the instructions step by step on how to do it. 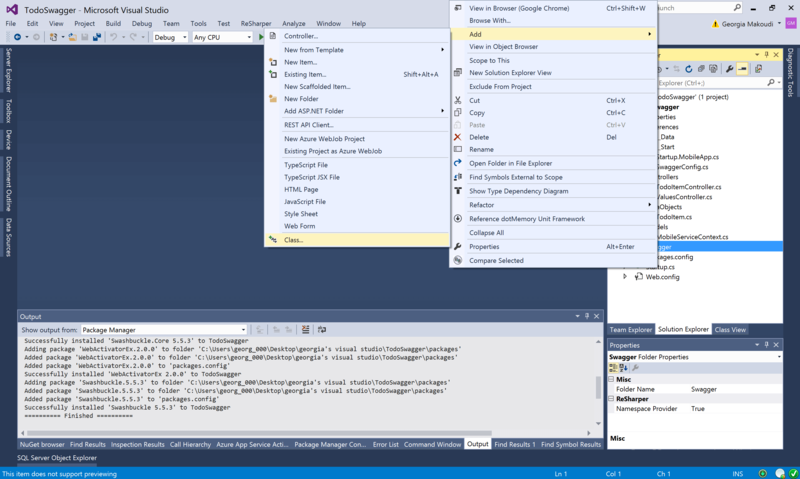 Swagger is an open-source framework that helps you test your RESTful Windows Azure APIs without writing complex C# scripts. 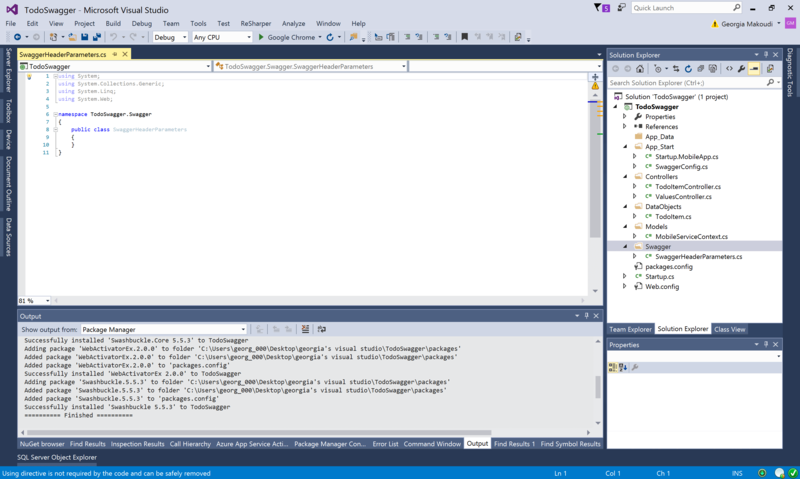 So, if you are developing an Azure-based REST service, Swagger is here to help you speed the development and testing process. 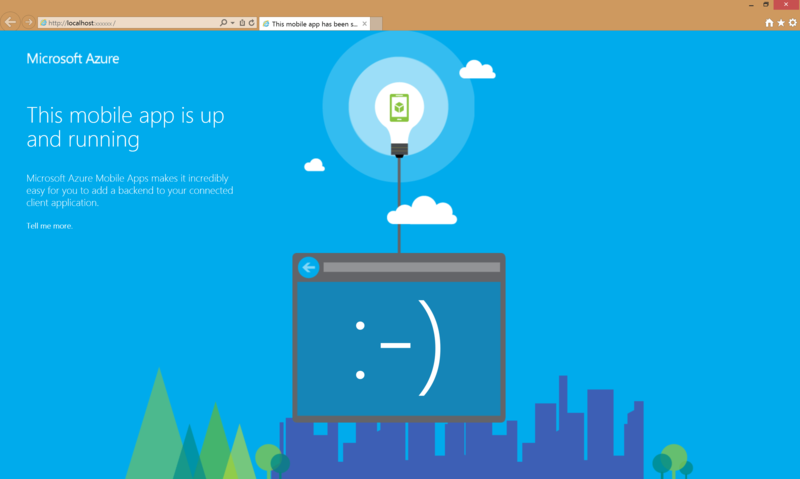 Login to the Azure Portal and launch your mobile service using your favorite browser. You can click any API to test it. 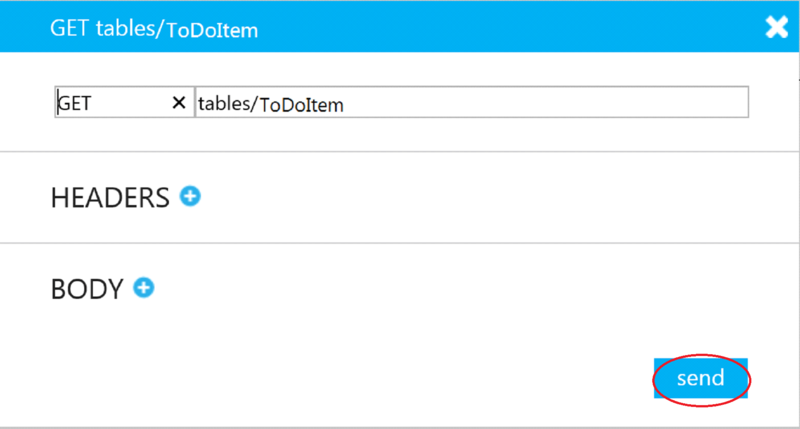 For example, click on “GET tables/ToDoItem” and then “try this out”. Since it requires authentication, you’ll get a “401/Unauthorized” response. 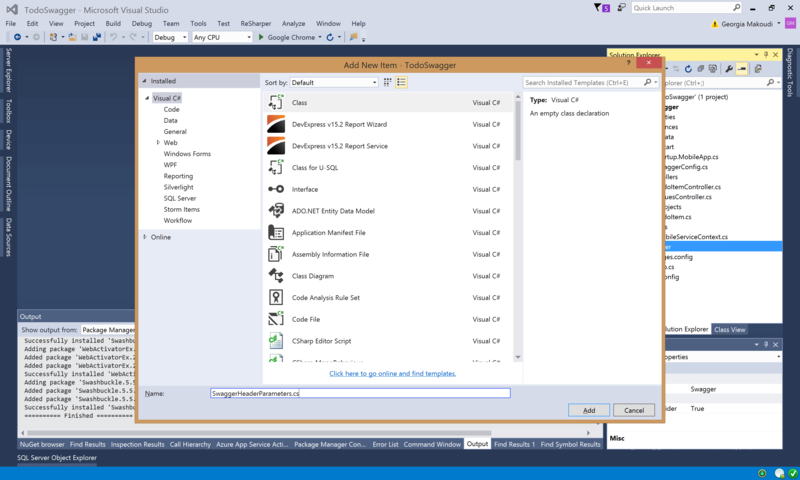 First, open your Azure Mobile App project using Visual Studio. 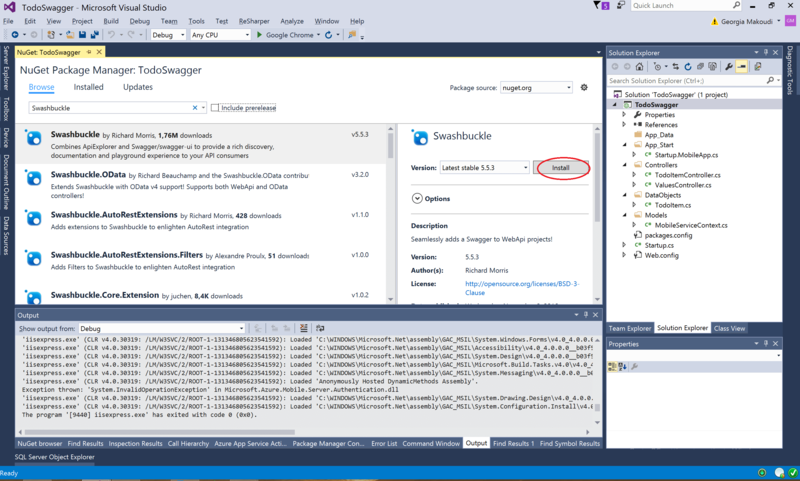 Search for “Swashbuckle” under nuget.org and click “Install”. A “Preview” windows will pop up to let you know which packages will be installed. Click “OK” to continue with the installation. A “License Acceptance” will pop up to inform you about terms and conditions. 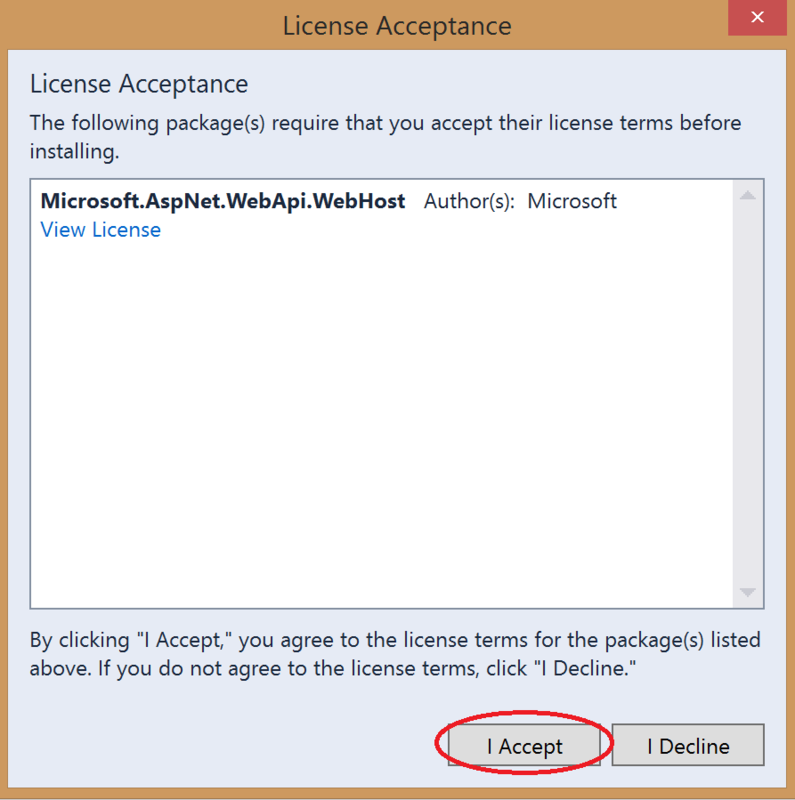 Click “View License” to read the terms and then click “I Accept”. Check the Output from Package Manager to make sure that Swashbuckle was successfully installed. Right click the project and add a new folder. Name the new folder “Swagger“. 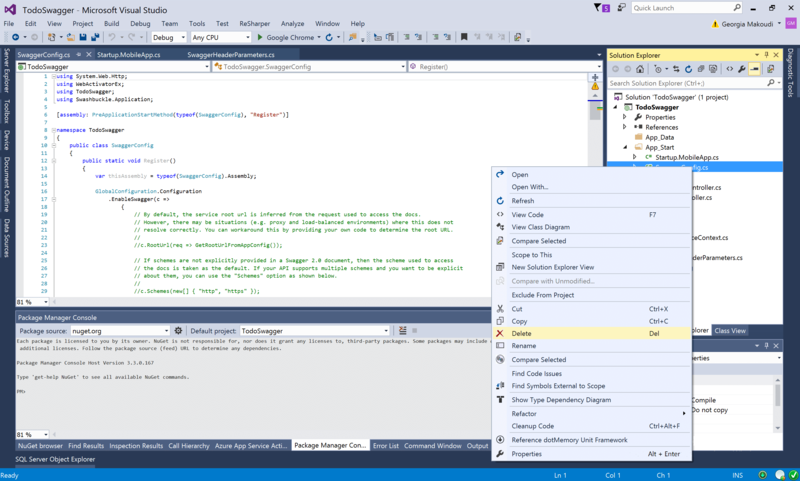 Right click the “Swagger” folder and add a new C# class. Name the new class “SwaggerHeaderParameters.cs“. 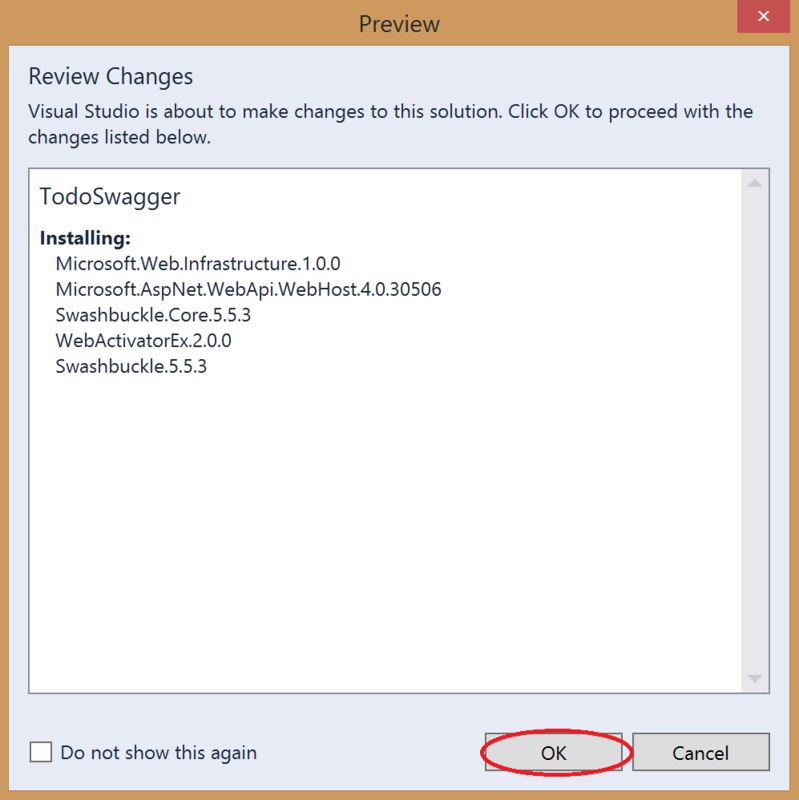 Change SwaggerHeaderParameters to implement interface IOperationFilter and import “Swashbuckle.Swagger.IOperationFilter”. 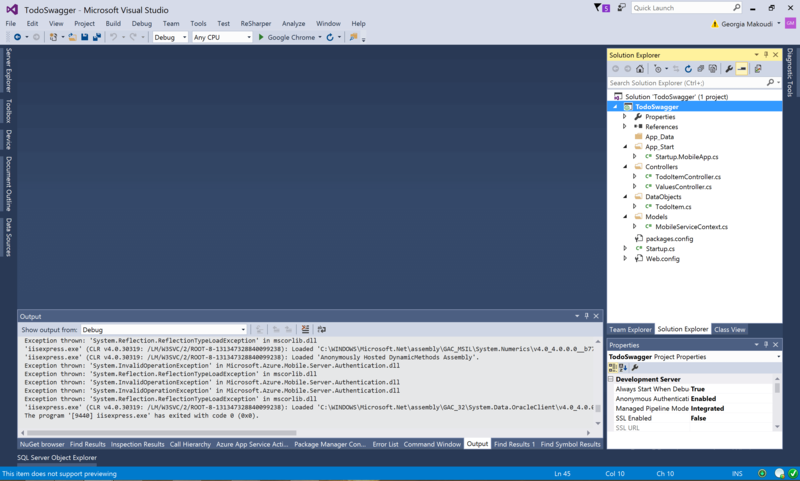 Then, add the string properties “Description”, “Key”, “Name” and “DefaultValue”. Add the void method “Apply” with parameter of type SwaggerDocsConfig and import “Swashbuckle.Application.SwaggerDocsConfig”. Then add “Description”, “Key”, “Name” in config header and set this as OperationFilter. Implement the Apply method declared at the IOperationFilter interface and import “System.Web.Http.ApiDescription”. Add operation parameters for the header, as shown below. 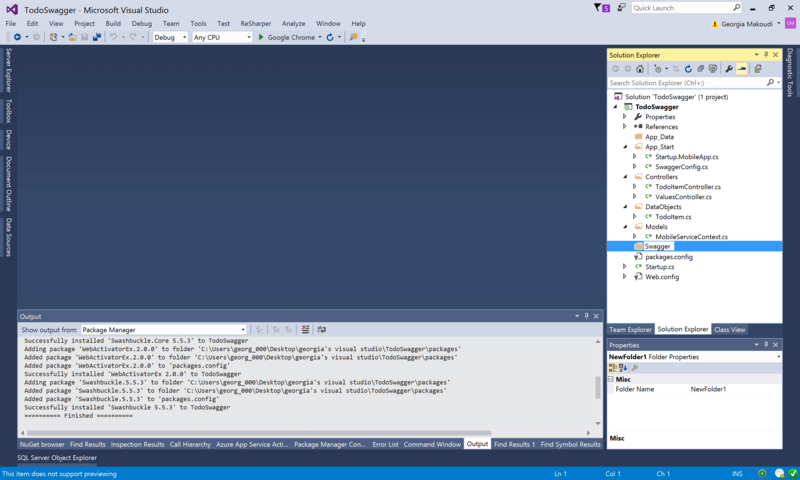 Opening folder “App_Start”, you will notice that a class named “SwaggerConfig.cs” was automatically created. We will include Swagger Configuration in “Startup.MobileApp.cs”, so right click on “SwaggerConfig.cs” and click “Delete”. Then, click “OK” at the informational popup window. If you want to add XML documentation to your project, right click the project and open its Properties. 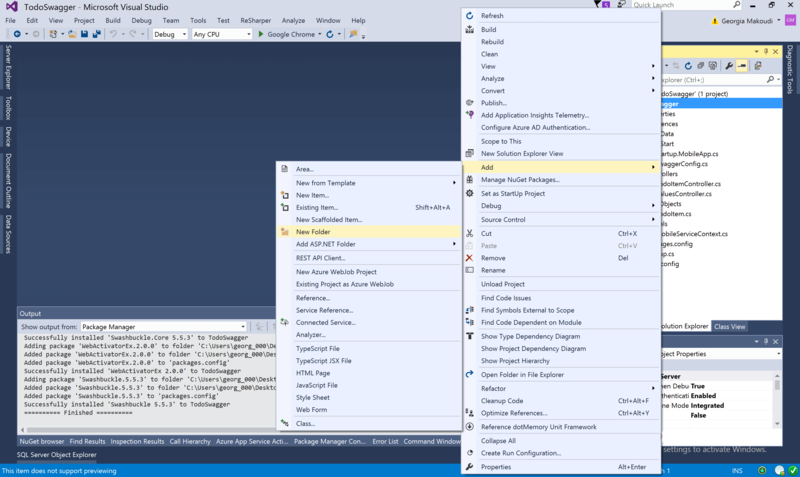 Select the “Build” tab and check “XML documentation file”. In case you added authorization to any of your controllers, add also the authorization header below. DefaultValue = "the authentication token needed"
Then, set your base path to the app’s base directory. 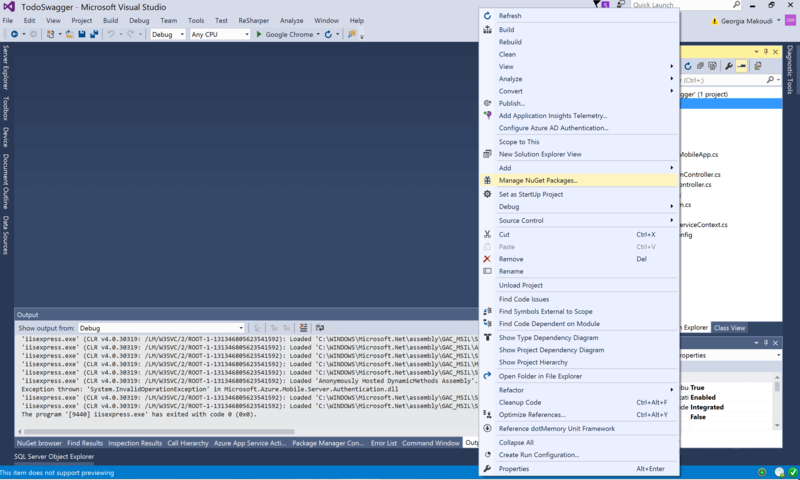 Enable Swagger and import “Swashbuckle.Application.HttpConfigurationExtentions.EnableSwagger”. 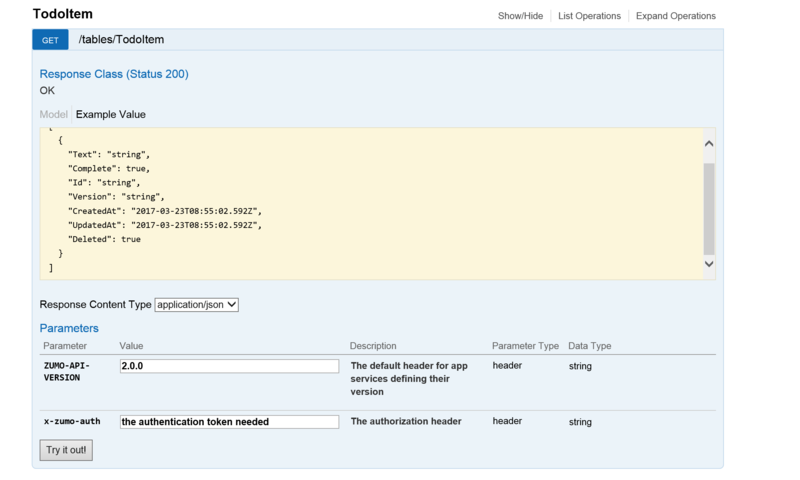 If you don’t have controllers with the [Authorize] attribute, don’t add the “authHeader.Apply(x)”. Same for “IncludeXmlComments”, if you didn’t check the “XML documentation file” option. Save your changes and rebuild the solution. 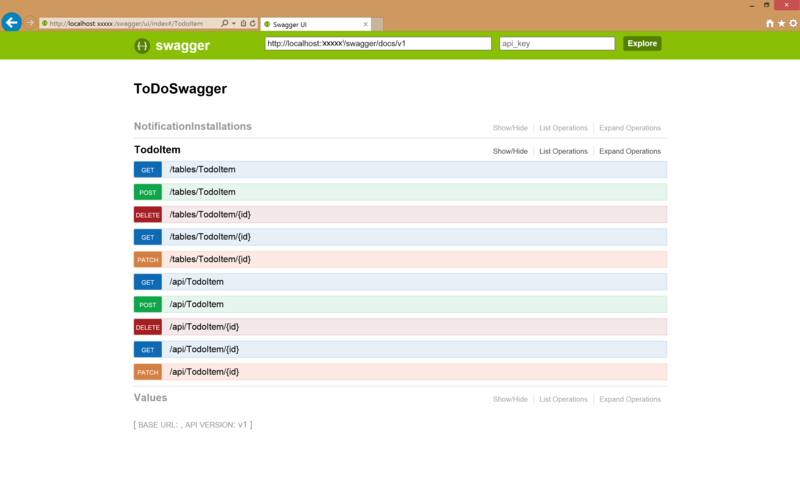 Add “/swagger” to the url of your running project and hit Enter. Now, you should see the list of your APIs. By default, Swagger creates your api path both under “/tables” and under “/api”. Your table controllers should be accessible under the “/tables” path and your API controllers under the “/api” path. In any other case, you get a “404-not found” error. 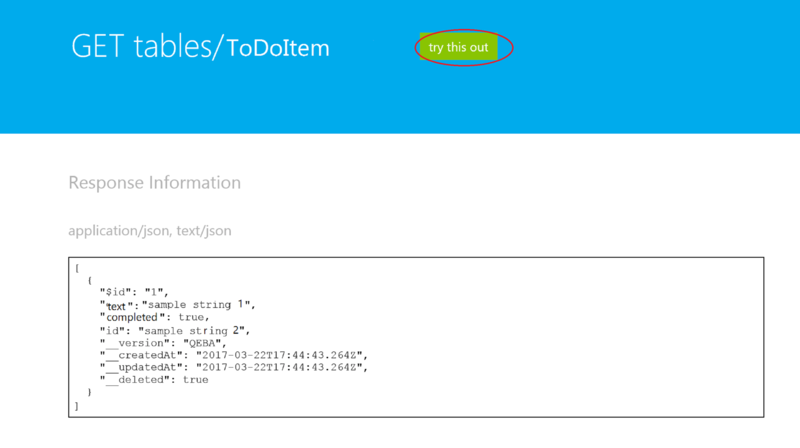 To try it, click “GET /tables/TodoItem” and then “Try it out!”. You don’t need to add an authentication token in “x-zumo-auth” since “TodoItemController.cs” doesn’t have the [Authorize] attribute. The following data are included in the response message. This is incredibly useful when testing and debugging your code! 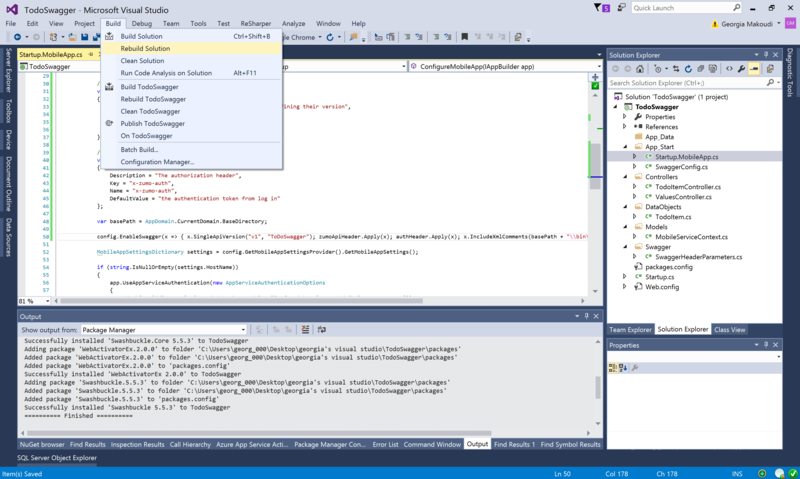 After that, all you have to do is publish your Azure Mobile App and add “/swagger” to the published url. Your test web client is up and running! If you checked the “XML documentation file” under the project Properties, be sure that you check it also when in “Release” Solution Configuration. 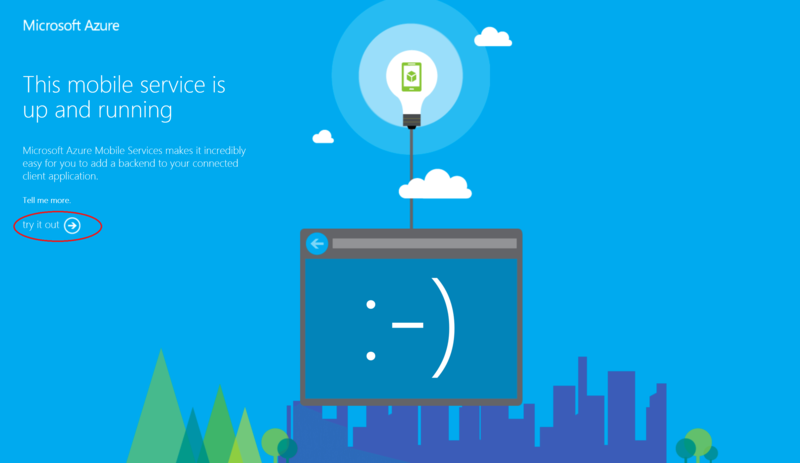 Otherwise, when you publish your Azure Mobile App and add “/swagger”, you will get a “500 -internal server error”. 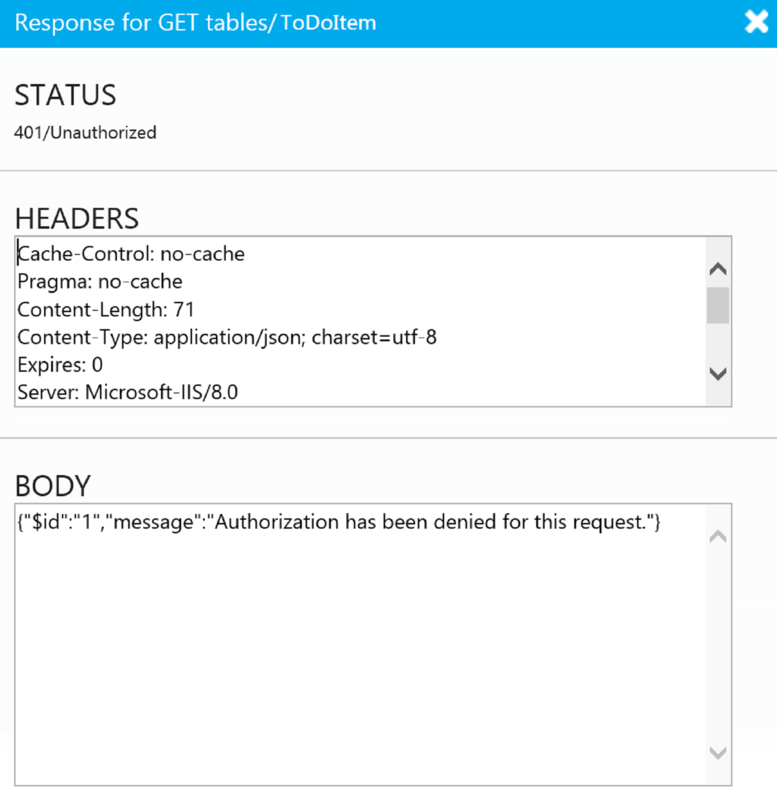 This is probably obvious to devs more familiar with Azure, but where does “the authentication token needed” come from? Never mind. Kind of obvious really. I need to call the login method using my credentials in order to obtain a valid token. Thanks for the article. It really helped out.